If you find yourself in a situation that requires a relocation to a new area, our lawyers can guide you through the process with ease. Military service men and women are often called upon to settle into new posts across the country, ALG offers many free benefits to assist them in their move. We have some amazing programs up and coming to help the prospective homebuyers to find new homes, learn how. 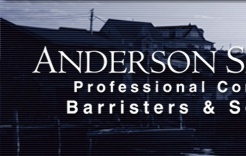 Anderson Sinclair Halifax Nova Scotia Real Estate Lawyers. Buying and selling commercial real estate is entirely different than residential real estate. The process is far more complex. Whether you are buying or selling commercial real estate, a good real estate attorney can make a difference. The risk is always present, maybe less if you have experience on your side. ALWAYS, ALWAYS, ALWAYS be sure your commercial real estate agreement is "Subject to review by your real estate attorney." HST, tax, and how you propose to structure your commercial aquisition are always very important questions to have answered before signing the agreement. Choosing the right legal structure for your business can impact on its future. Consulting a professional will help you evaluate your individual situation and advise you on which structure best matches your circumstances. Sole Proprietorship is the simplest, and is relatively easy, fast, and inexpensive to set up. The law requires a business to be registered in the province where it is located. Proprietorships allow you to write off business losses against your personal income, which may be attractive in the early years of a company when losses are not uncommon. However, you can be held personally liable for your business debts and expenses. In some cases, this has meant the loss of owners' savings and home. Partnerships are very similar to sole proprietorships, but are complicated by the existence of multiple owners. Working together, members of a group can pool their knowledge, finances and resources. Sometimes this works well and strengthens the venture. However, when partners disagree, the results can be disastrous. Incorporated businesses can often benefit from a number of legal and tax advantages not available to proprietorships or partnerships. Incorporation can provide some protection against personal liability for the corporation's debts. But there are disadvantages, especially for small businesses, the process of incorporation can be expensive to set up and involve complexities which often require the services of a professional. © 2014 Real Estate Lawyer Halifax Nova Scotia Canada. Anderson Sinclair All rights reserved.